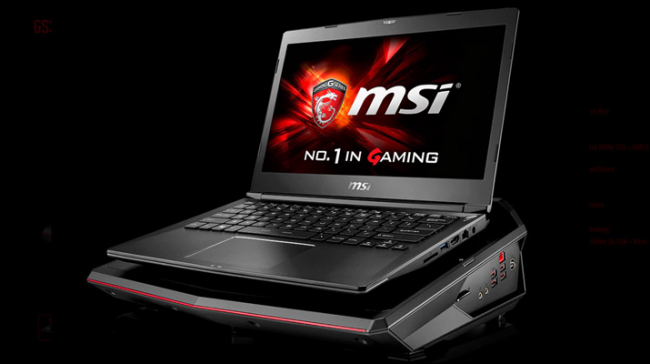 Laptops, especially gaming laptops, are a study in compromises. Smaller machines are lighter and easier to travel with, but bigger, heavier boxes offer the dedicated graphics cards necessary for high-end gaming. An external graphics card let you have your cake (no lie) and eat it too. An external GPU (or eGPU for short) is a dedicated box that combines an open PCIe slot, a desktop-style power supply, and a full-sized graphics card that plugs into your laptop. When you do, you have gaming desktop power and connectivity without sacrificing those svelte modern laptop designs. This sort of thing has been attempted before, but recently there has been a rise in these products. 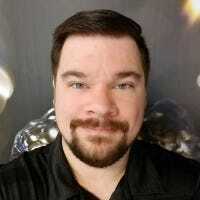 The high data and video bandwidth in single-cable connections like USB 3.0 and Thunderbolt 3 has finally enabled the kind of lightning-quick connections needed to offload GPU processing to external hardware, while still relying on a laptop’s internal motherboard for standard computing. An extra bonus: a lot of external GPUs come with extra USB ports, Ethernet, and more, which means it’s easy to plug and play with a ton of extra hardware, like multiple monitors or gaming keyboards and mice. At the moment, the de facto standard for this high-bandwidth operation is Thunderbolt 3. With a 40 Gbps connection that can handle simultaneous video, audio, data, and an Internet connection, plus up to 100 watts of power on supported hardware, it’s a single cable that really can do it all. And since it uses the standardized USB-C port (the one found on the new Macbook, later revisions of the XPS 13, and more and more laptops every day), it’s becoming more adaptable from a pure hardware perspective. That said, software is another issue. Right now most external GPU systems rely on fairly complex and specific drivers, enabling laptops to hand over the load from their integrated graphics chip to the dedicated NVIDIA or AMD graphics card. This is some complex stuff, so universal solutions are rare, and companies like Dell and Razer only support external graphics on specific laptop models. Some more general options, as well as older standards like USB 3.0 and Thunderbolt 2, offer more options but poorer graphics performance. Unfortunately, external GPUs are still an emerging segment, and several years after the first models were introduced they remain thin on the ground. Here are the current options from the major PC manufacturers. This is probably the best-known external graphics setup, if only by dint of Razer’s sheer presence in the desktop gaming accessory space. The Razer Core is a little black box that manages to still be attractive, thanks to a beefy 500-watt power supply for the biggest and baddest graphics cards, built-in USB 3.0 connections for external drives and accessories, and dedicated Ethernet for fast online connections. It has room for the largest AMD and NVIDIA GPUs on the market, compatible with double slot cards up to 12.2 inches (310mm) long. It’s also the most stylish option on this list, with support for Razer’s open Chroma RGB lighting API. But at $500—without the graphics card itself—it’s one of the most pricey. Razer says it doesn’t limit the functionality of the Thunderbolt 3 graphics connection to its own machines, but the only laptops certified to work with the Core are Razer’s Blade and Blade Stealth, which are more expensive and offer fewer customization options than many competitors. Trying out the Core with more generic systems has met with mixed results, so purchasing it without a companion Razer laptop is something of a crapshoot. 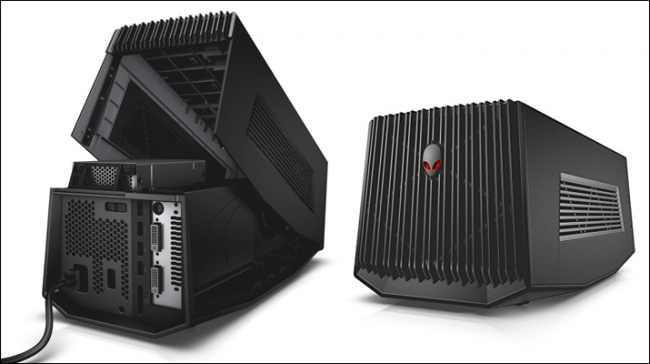 Dell’s gaming sub-brand Alienware is on board with the eGPU revolution, and as you might suspect, its offering is one of the cheapest on the market. What the Graphics Amplifier lacks in panache it makes up for with its $200 price tag (without the GPU and laptop, of course). It’s also the only eGPU option from a major brand to use the older USB 3.0 standard, which unfortunately means compatibility with AMD XConnect, AMD’s semi-proprietary set of drivers for easily handling eGPUs, is out. You have a variety of compatible laptop options, from the relatively tiny Alienware 13 to the monstrous Alienware 17…which probably doesn’t need an external GPU for most games anyway. But that lower price tag does come with a few sacrifices. The Amplifier is limited to graphics cards that are 10.5 inches long, making some of the most bombastic NVIDIA and AMD models incompatible. While the Graphics Amplifier has four USB 3.0 ports for expansion, there’s no Ethernet port, meaning you have one extra cable to plug in to your laptop if you want the fastest gaming connection. It’s also a real bummer that Dell is only supporting Alienware laptops, rather than including their more utilitarian XPS line—which would make for a fantastic combination. PowerColor is a GPU and accessory maker, not a dedicated system-seller like Razer or Dell. 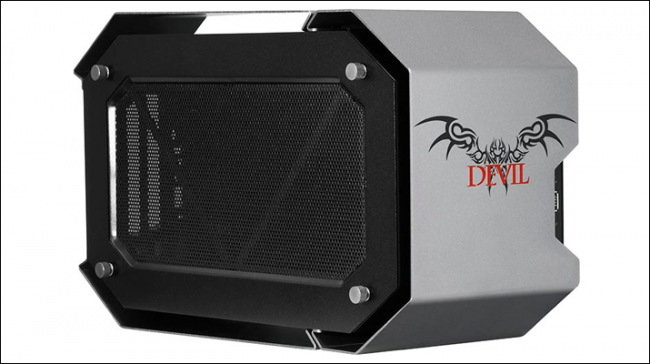 Appropriately, the sinister Devil Box is allegedly compatible with any Windows-based PC that can use a Thunderbolt 3 port with external graphics, plus any AMD or NVIDIA graphics card (including those not made by PowerColor itself). 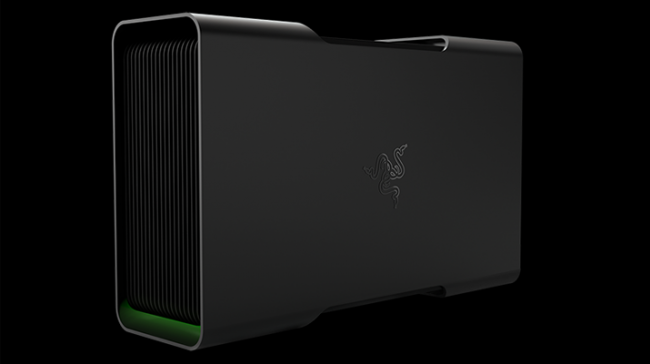 The box supports all the bells and whistles of the Razer Core, including oversized GPUs, an Ethernet connection, and up to 375 watts of power to the graphics card. It even has an internal SATA III slot for sliding in a 2.5″ hard drive or SSD for backup or external storage—a nice touch. The Devil Box is a bit pricey at $450, but the potential for multi-system compatibility is probably worth the extra money for anyone planning on keeping it through multiple laptop and GPU upgrades. The “tramp stamp” and “DEVIL” branding might not be everyone’s cup of tea, but hey, you can always throw it under your desk. The MSI Gaming Dock, available only in an expensive bundle with the company’s gaming-branded Shadow GS30 laptop, is the least versatile option on this list. That said, it isn’t really trying for the same market: the Gaming Dock is a companion device, which crams in extras like a 2.1 speaker setup, microphone and headphone ports, a full-sized SATA 3.5″ slot, and a Killer brand networking card. It’s designed to sit right below the laptop as an elaborate stand, as the proprietary connector plugs directly into the bottom of the notebook. The slightly newer Gaming Dock Mini is sleeker and more angular, but omits the speakers and adds vents for passive cooling. The Gaming Dock is really only an option if you’re absolutely sure you want the Shadow GS30 in particular…and since neither it nor the Dock have been significantly updated in quite a while, that’s probably not a great idea unless you find it on a massive discount. ASUS ROG XG Station 2: The XG Station 2 is the only eGPU tool so far will be explicitly compatible with a Windows tablet: the new premium ASUS Transformer Book line. (It’s like a Surface Pro, only Taiwanese.) It’s also compatible with one of the more powerful builds of Intel’s teeny-tiny NUC computer, though plugging it into a small desktop would seem to defeat the point of a plug-and-play system. The only major downer here is that ASUS is taking its sweet time getting the ROG XG Station 2 to market: nearly two months after announcement, there’s no hint of a release date or price. Gigabyte GP-T3GFx: like the Devil Box above, Gigabyte’s alphabet soup of an eGPU enclosure is designed with maximum compatibility in mind. It can handle the largest graphics cards and should work with and Thunderbolt 3 eGFX-compatible system, though this vertical design does omit extras like USB ports and SATA slots. Unfortunately, we haven’t seen hide nor hair of the in-progress product since Gigabyte showed it off last summer, thought it’s officially still coming. The Wolfe: this Kickstarter project is an eGPU designed with Mac users in mind. In addition to the absolutely requisite aluminum enclosure, it’s sealed with either an NVIDIA GeForce GTX 1050 or 1060 inside, and trying to swap out the card will void the warranty. The upside is that it’s smaller and more portable than other eGPU products. The Wolfe production team still claims that the product is coming on its website, but after a cancelled Kickstarter campaign due to Thunderbolt licensing issues, the future is looking grim. Others may be on the way in the further future, but this is what we know right now. None of the above tickling your fancy? It is possible to make your own eGPU with a mix of the right cables, a PCIe port mounted on a custom slice of motherboard, and a separate desktop power supply. The bad news is that this is still largely unexplored territory, supported by an enthusiastic but small community of modders and a handful of part suppliers. Thunderbolt 2 PCIe enclosures offer an all-in-one solution, but the bandwidth for graphics is lower than the products above, and driver support can be iffy. More generalized PCIe adapters require a custom case or an open air setup, and there’s often no way of knowing it will work with a specific laptop except to actual build it, install drivers, and plug it in. For the time being, the retail eGPUs are probably a safer if more expensive bet—you can always return them if they don’t work.